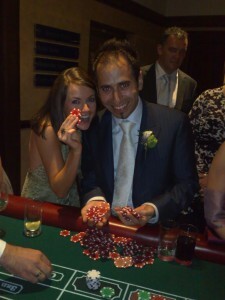 We offer a professional casino service for your wedding reception, that creates a WOW factor! Guests of all ages can play the games which makes the casino a wonderful icebreaker and a great way to create interaction between your guests and family. 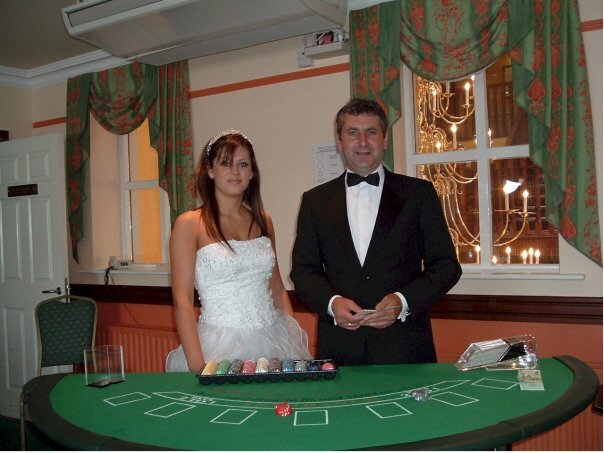 A wedding casino is always highly appreciated for the fun and enjoyment it brings to your guests and will make it a truly memorable occasion for years to come. No real money is involved with a fun casino. 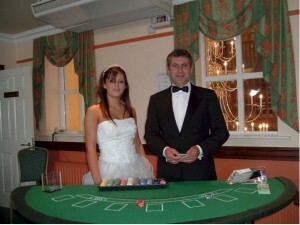 You and your wedding guests use ‘fun money’ to exchange for chips supplied by our professional croupiers. At the end of the gaming session, the guest with the most chips left can win a prize. Our professional croupiers will ensure the event runs smoothly and will be happy to explain the game rules to first time casino players. Our tables include American and European Roulette, Casino Stud poker and Blackjack. The casino can be operated either in the afternoon in the space between the ceremony and the meal or in the evening after the speeches in the time gap where the room gets changed around and the Band / DJ sets up. Why not personalise your fun money with you and your partner’s picture printed on every note. You can hide the money in envelopes and place each dinner table as a wedding favour not to be opened until later. After the speeches, the groom can announce to open the envelopes and also announce that a fully working casino is open to play in the lobby or bar area!